In a disturbing new trend of “instant” hurricanes forming just days before landfall, Hurricane Michael formed Monday morning in the Caribbean Sea and is heading for a landfall as a major hurricane with 120-mph winds along the Gulf Coast by midweek. Maximum sustained winds have increased to near 75 mph with higher gusts, the National Hurricane Center said. Steady to rapid strengthening is forecast during the next day or so, and Michael is forecast to become a major hurricane by Tuesday or Tuesday night. “Heavy rainfall, wind and storm surge impacts will be possible across portions of the northern Gulf Coast by midweek,” according to the hurricane center. Similar to Tropical Storm Gordon, which appeared without warning last month, but never achieved hurricane status, this new storm gives Florida residents little time to prepare. As the storm approached, Florida Gov. Rick Scott declared an emergency in 26 counties Sunday night including Escambia and Santa Rosa counties. Southwest was the first airline to react and has implemented a flexible rebooking policy for customers scheduled to fly to or from several cities in the storm’s path this week, including New Orleans, Panama City, Florida and Pensacola, Florida Tuesday through Thursday. The waiver also covers passengers traveling to or from Cancun, Mexico and Havana, Cuba through Tuesday. “Customers who are holding reservations to/from/through the cities listed above on the corresponding dates may rebook in the original class of service or travel standby (within 14 days of their original date of travel between the original city-pairs and in accordance with our accommodation procedures) without paying any additional charge,” the airline’s website stated. Meanwhile, Delta Air Lines said that its Meteorology team in the airline’s Operations & Customer Center was continuing to monitor Michael and that the airline will release more updates as the system develops. 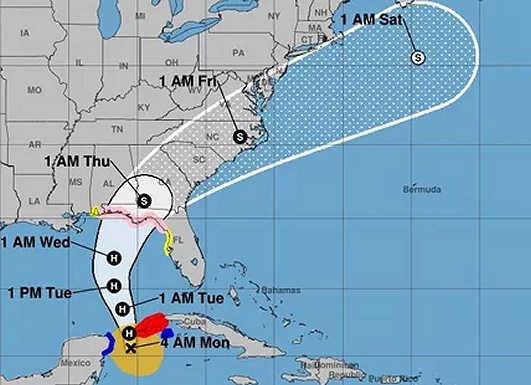 The current track would have Michael come ashore near mostly smaller regional airports, though the system is then projected to move toward Atlanta and possibly Charlotte after making landfall. Also a factor, it could dump additional unwanted rain on the Carolinas, which were battered by Florence in September. “Areas hit hard by Florence may face disruptions to ongoing cleanup efforts or renewed flooding depending on the track of the storm,” AccuWeather senior meteorologist Kristina Pydynowski said.